I started with a wooden shamrock from a craft store. It cost 50 cents. First, I painted it green. After it dried, I wrote “Father, Son, Holy Spirit”- one on each of the shamrock leaves- with a regular black sharpie marker. Soooo much easier than trying to write it in paint! Then I printed out a picture of St. Patrick and glued it to the middle of the shamrock. I finished it off by tying a cute little bow around the shamrock stem. I wanted to go around the outside of the shamrock with green glitter glue, but we didn’t have any. Father- Eye (for the Fathers “all-seeing eye”), a church, a heart, or a bible. 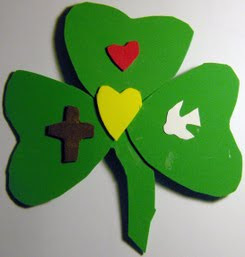 You can cut your shamrocks and symbols from anything- green paper, fun foam, whatever really. If you’re worried about drawing a shamrock yourself, you can use these printable shamrock templates from Family Fun! Wildflowers and Marbles made this cute shamrock. Find directions over on her blog! I'm so glad I found your blog! It is awesome!